There is a small makers mark to underside 'EG', and the Burner is marked Kosmos Brenner. No dents, gashes or holes. Antique Brass Wall Light - Original Gas Wall Light Converted and wired. 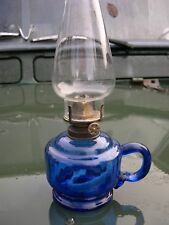 An original antique gas light which has been converted to electricity, rewired and pat tested. Is in very good condition with its original fittings. The glass is very slightly darker and more purple than it looks in the pictures. There is a sharp tooling edge at the bottom of the hand applied handle. Usual wear rubbing to underside of base. "VICTORIAN". Duplex Oil Lamp Supported on a Reeded Column c1890 - 1910. 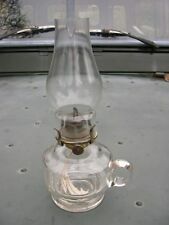 Duplex Oil Lamp. Supported by aReeded Column on a Ormolu Base. We have Listed this Item World Wide. Bronze Shoes and Grey Slate which is 500 million years old. Antique etched glass globe duplex oil lamp shade, featuring Arts & Crafts decoration. The cut glass font has 11 vertical cut and polished 'slices' or facets. If used in a caravan or boat need to be aware of heat output from the chimney, the hot 'exhaust' needs to be kept clear of flammable furnishings etc. Set of 3 lovely old antique etched glass globe duplex oil lamp shades featuring Arts Nouveau decoration. The lamp has relatively new wiring, it is in excellent condition, it is 19” across at the floor, it is 65” high to the bayonet when extended. I have shown the lamp with a shade, this is not included, this is a heavy piece so very stable. Vintage gold mustard glass oil lamp shade globe Victorian? 10" X 11" Victorian glass lamp shade. Great condition. Any questions please ask. The body with slight varying Vaseline yellow hue colour fading to clear mid section, with 8 frill tulip top edge. 19th century, Pink Glass Frilled & Etched. OIL, Kerosene LAMP Signed, S. R. & Co. CUPID, PUTTO. Perfect condition, to see detailed Photos. Secure transport. parcel are assured in case of loss or from deterioration. Art Nouveau Brass Vaseline Opalescent Glass Lantern. Original English antique handcrafted Arts & Craft Art Nouveau lantern with spectacular Victorian striped vaseline opalescent glass shade. Spectacular English Antique Arts & Crafts. Light rubbing on the bronzed finish & tarnish scattered on the top. HAND PAINTED SATIN GLASS has a few spots of wear and rubs but largely is in GREAT CONDITION. Spectacular Antique Vaseline Opalescent Copper Lantern. It houses a spectacular vaseline opalescent glass shade, that is very lively in colour. Original antique copper lantern beautifully crafted in a weaved strap pattern. Hand made by the wrought iron artist Rino Baglini of Chiavari (north of Italy) during the second half of the XXth cent. Wrought Iron. WROUGHT IRON WALL LIGHT. Elegant handmade wrought iron sconces from Shari Baglini of Chiavari richly decorated with flowers in painted sheet. Tripod Material : Steel & Aluminum. Tripod Finish : Nickel Finish. Wiring Available : As per country standard ( US, UK, AU, EU ). Type : Floor Lamp/Corner Light. Bulb/Globes : E 27 ( Standard Screw )--------------- Bulb Not Included. The lantern is impressed Osler, for F & C Osler. Genuine antique arts & craft lantern in brass with its original glass shade. Spectacular English Antique Arts & Crafts Brass Copper Lantern. 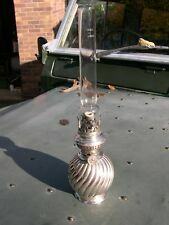 In good condition this fine quality lantern includes socket and is beautifully made. Lamp Material : Brass & Aluminum, Wood. Lamp Finish : Black Finis h. BULB WILL NOT SEND WITH ANY LAMP FOR SAFETY REASONS. Style : Modern. Type : Desk Lamp/Corner Light. This is a genuine English antique arts & craft lantern in brass with antique uranium. vaseline opalescent glass shade. Spectacular English Antique Arts & Crafts Copper Beaten Brass Lantern. The shade has a few nibbles on the rim this is not seen when the lantern is suspended. Antique lantern with genuine Victorian vaseline opalescent glass shade. This glass shade is very lively and really brings this lantern to life, it is vaseline glass with opalescent band. This lantern feature lovely open fretwork and is all brass. Antique English Arts & Crafts Brass Victorian Vaseline Opalescent Glass Lantern. It features a lively old opalescent vaseline glass shade that throws colours hues of green, blue, yellow and ruby. Along with the colour changes of the brass lantern this shade is very entertaining to the eye. Lamp Finish: Pewter Finish (as shown in picture). Lamp Material: Wood, Steel & Aluminum. BULB WILL NOT SEND WITH ANY LAMP FOR SAFETY REASONS. Care 1: Wipe with a soft dry cloth only. This is a Reproduction Item, Not Sold As Antique. Type : Desk Lamp/Corner Light. Although the raw material and resources that we use is earthen ranging from Brass, bronze, copper, steel, wood, Iron & leather. Shade Finish: Brown Antique Finish. BULB WILL NOT SEND WITH ANY LAMP FOR SAFETY REASONS. Type : Desk Lamp/Corner Light. Bulb/Globes : E 27 ( Standard Screw )--------------- Bulb Not Included. Wiring Available : As per country standard ( US, UK, AU, EU ) - Two flat parallel plugs. Maker Doulton. Primary Material Ceramic & Porcelain. Age 1900-1940. Color Multi-Color. Country/Region of Origin England. Type : Desk Lamp/Corner Light. Lamp Material : Wood, Steel & Aluminum. BULB WILL NOT SEND WITH ANY LAMP FOR SAFETY REASONS. Style : Modern. This is a Reproduction Item, Not Sold As Antique. Care 1: Wipe with a soft dry cloth only. Lokta, commonly known as lokta paper, has been crafted in the traditional way for more than 1000 years. Lokta paper is appreciated for its exceptional durability, attractive texture and strength of its fiber. Type: Desk Lamp/Corner Light. BULB WILL NOT SEND WITH ANY LAMP FOR SAFETY REASONS. Although the raw material and resources that we use is earthen ranging from Brass, bronze, copper, steel, wood, Iron & leather. Type : Desk Lamp/Corner Light. Lamp Material : Wood, Steel & Aluminum. BULB WILL NOT SEND WITH ANY LAMP FOR SAFETY REASONS. This is a Reproduction Item, Not Sold As Antique. Care 1: Wipe with a soft dry cloth only. Primary Material Glass. Age 1900-1940. Color Multi-Color. Victorian glass lamp shade in excellent condition. Bottom rim is fire polished smooth. Top rim is cut and ground and has the usual flaked edge as it was made. The glass has the usual streaks and spots of colour in the mix as you expect in old, hand made glass. Type : Desk Lamp/Corner Light. Bulb/Globes : E 27 ( Standard Screw )--------------- Bulb Not Included. Wiring Available : As per country standard ( US, UK, AU, EU ) - Two flat parallel plugs. Tripod Material: Wood.